While snorkelling to monitor the ecology of bass spawning, our crew often come across many other interesting things. One of the highlights from this season was a bay on the St Lawrence River where several large channel cats were nesting in abandoned tires. Similar to bass, male channel cats make nests in late spring and early summer (usually around rocks or woody structure) and then guard the eggs deposited by a female. 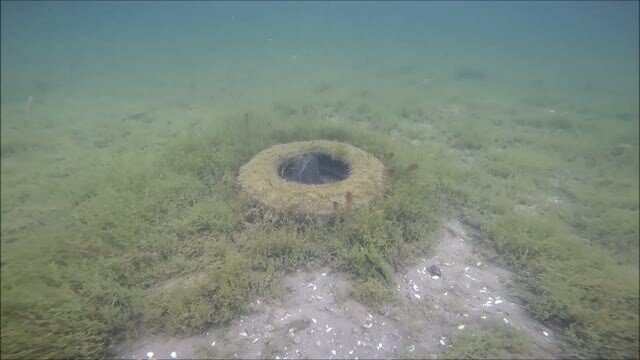 In this case, it was interesting that the bay was full of round gobies (known egg predators), but the tires seemed to create the perfect defence strategy to keep gobies away from the eggs…no gobies were observed inside the tires. One can’t help but wonder whether this was intentional or simply coincidence.